Katniss Everdeen survived the Quarter Quell, but Peeta has been captured by the Capitol. She discovers that there is a rebellion and that she is an essential part of it because she is the Mockingjay. Katniss learns that District 12 does not exist and she finds her way to District 13, where all of the survivors of District 12 have gone. After a series of events, Katniss agrees to be the Mockingjay and has many conditions. The rebels film a series of propos containing Katniss with the intention of unifying the districts. Peeta is brought back by the rebels, but displays abnormal behavior, due to torture. Burdened by grief, Katniss takes a trip to District 2, hoping to include them in the rebellion. At Two, Gale plans to explode the Nut, the mining center of District 2. Katniss is shot in the process and meets Johanna Mason. Since Katniss and Johanna do not have sufficient training to go to the Capitol, they train together and take a test that determines whether they would be able to go to war. Katniss passes the test but, Johanna is held back due to her trauma. When Katniss is in the Capitol, Peeta is sent to her squad by Coin, president of District 13, with the intention of killing Katniss. While in the Capitol, Katniss is caught with the responsibility of trying to stay alive. Many deaths occur, but it does not interfere with Katniss’ determination and ability to stay strong. This book was an interesting book, comparing it to the first two books of The Hunger Games trilogy, but it was also very confusing. It was hard to understand what was happening in some parts of the book. The book was also very slow-moving. It did not have enough action to keep the story moving. 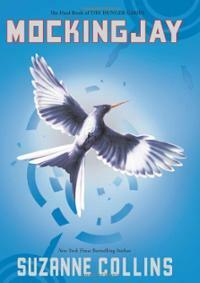 A strength in this book was that it provided a more deeper explanation of the main character, Katniss. Since the author also included some events that occurred in the previous books, it had a good explanation of Katniss’ life. The author also displayed a good word choice. If I were to go back in time, I would choose this book again because of how well the first two books in the trilogy were written. I would recommend this book to a thirteen to fifteen age group because of the book’s language and complexity. Overall, I would rate this book eight out of ten stars. 1. Why does Katniss feel angry when President Snow sends her a rose? 2.Why would the main character, Katniss, agree to be the Mockingjay? 3.How does Katniss feel about her sister, Prim. 4. How is Katniss’ relation with President Coin? 5. Why does Katniss hate District 13 despite, what it has provided for District 12? 6. Throughout the first and second books of the Hunger Games trilogy, Prim was shown as a soft, sensitive and defenseless girl. Based on the two books, how has Prim changed in the third book because of their circumstances? 7. What was the Capitol’s intention by bombing 13? 8. Why would Katniss stop Gale from exploding the “Nut”? What does she feel about the people inside the “Nut”? 9. Why does the injured man hesitate to shoot the Mockingjay? 10. Panem et Circenses translates into Bread and Circuses. How does that relate with the Capitol and the districts? 11. Why would Johanna Mason and Katniss want to go to war? 12. Why does Johanna Mason feel pain when it starts to rain during training? 13. How does Katniss feel when she sees the Capitol laced with pods. 14. When Boggs passes away, how does Katniss’ role in the war change? 15. How does Katniss feel when Gale “killed” her sister?